An adult Brown Banded cockroach is ½ inch, brown with two lighter bands across the body and wings. The male’s wings are the full length of their bodies and are capable of flight. The female’s wings are 2/3 the length of their bodies and are not capable of flight. Brownbanded roaches are found indoors and usually harbor in high areas such as ceilings, picture frames, closets and upper cabinets. They do require warmth but less moisture than the German Roach and therefore can be found throughout the structure, not limited to kitchens and bathrooms. 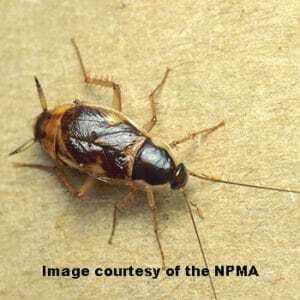 If available, Brownbanded roaches prefer foods high in starch including wallpaper glue, book bindings, stamps, etc. They are however opportunistic feeders and will take advantage of any food source available. Sightings of this pest will be most common at night as they are nocturnal. The egg capsule of this pest is 3/16 inch, yellowish or reddish-brown and will be found attached to the crevices on the underside of selves, picture frames, furniture, etc. Droppings of this pest, resembling pepper, can be found in the areas it takes harborage.